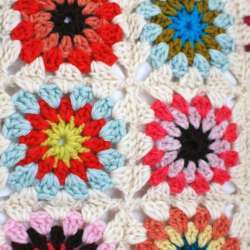 this month we'll be learning how to make granny squares! We learned these stitches in the "Intro to Crochet" activity and we will revise them before we start on our first granny square. You can use any sized hook. For beginners I recommend going for a size 5mm hook. Lighter yarn and smaller hooks will give you a smaller granny square!